HSAP formally adopted a logo featuring the Lā‘au Kīkē, Hawaiian 'Poi Pounder' Gavel. 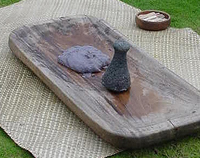 Since ancient times Polynesians have used poi pounders (pōhaku ku‘i poi) made of stone, to pound cooked taro root into poi, a native starch and the main staple of the traditional Hawaiian diet. Poi had great significance in the Hawaiian culture, representing Hāloa, the ancestor of chiefs and kanaka maoli (Native Hawaiians). There is a great reverence for the presence of poi at the table. Steamed in an earth oven, the taro root was peeled with a shell scraper, and placed on a wooden pounding board to be mashed with the stone pounder. Pounders of various designs have been used throughout Polynesia. On the other hand, probably the most recognizable symbol of parliamentary procedure has long been the tradition hammer-shaped wooden gavel, believed to have Masonic origins. As local artists in Hawaiʻi have often given homage to their forebearers respecting instruments like the poi pounder not just as a historical artifacts but as symbols of Hawaiian nurturing, eco-friendly life styles that suggest a time when families and communities joined together humbly and peacefully in harmony to produce the sustaining staple of their culture. Wooden poi pounders produced by contemporary Hawaiian wood crafters, honor the state's host culture. Its unique shape lends itself to be a symbolic instrument of fairness in modern Hawaiʻi, and wooden poi pounders are now being used as gavels in various proceedings.